So, over Memorial Day weekend, the pump went out, which sounds terrible, until you realize that it could’ve been so much worse. Like, what if the well had gone dry and that’s why the pump wasn’t working? Oh. My. God. See, we had this inspection coming up Tuesday morning (that’s today), and all along I’ve been telling Steve, “Let’s sell this place before something goes wrong with it,” and then, whoosh, no water on Sunday, and I’m thinking, “This is that something going wrong I was worried about,” but as it happens, Steve’s philosophy degree, the one that he got before he got his chemistry degree, continues to pay big dividends. He called the friendly Ace Hardware man and got a replacement pump and put that sucker right where the old one was, and voila! we had water again! I was very happy about this for a couple of reasons. One is, you don’t really appreciate toilet water like you do when there’s a sudden lack of it, and two, snaking a long hose over to the neighbor’s house for water is a sure way to discourage interest in someone looking to buy a house. I was watching people slow down and speed up as they drove by all weekend. Ah well. We only need one buyer anyway, and he seems very nice. Young. My god, how young, he can’t be thirty years old yet, but very nice. He and his broker and the inspector showed up bright and early this morning and Steve and I loaded up the dogs and left them to it. Yes, yes, it could have been far worse. So I’m giddy, and that’s what this little painting is all about. 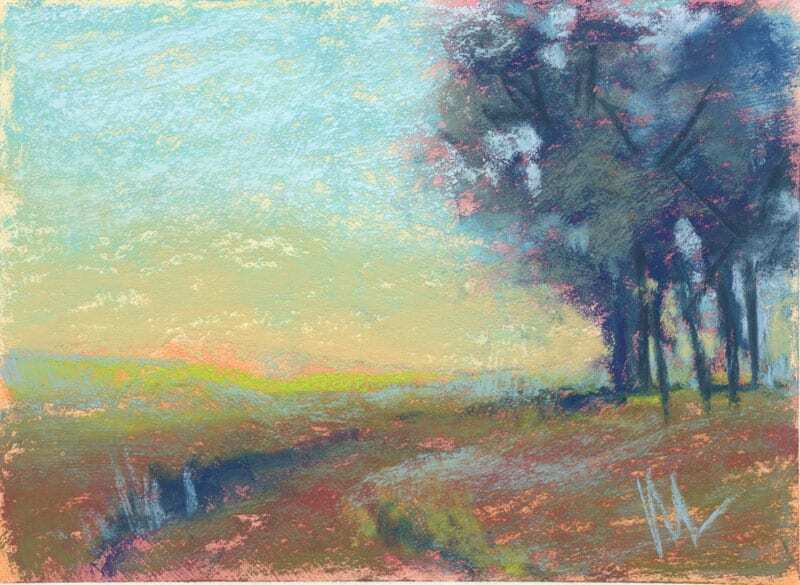 Nothin’ But Blue Skies, 5×7″ pastel on Crescent board with pumice ground by Marie Marfia. $75, unframed. Contact me to purchase. This entry was posted in A pastel a day, Emotional Landscapes, Landscape, painting a day, Pastels, Woods scape and tagged emotional, inspection, landscape, painting, pastel, pump, selling the house, toilet, water on May 31, 2016 by Marie Marfia.